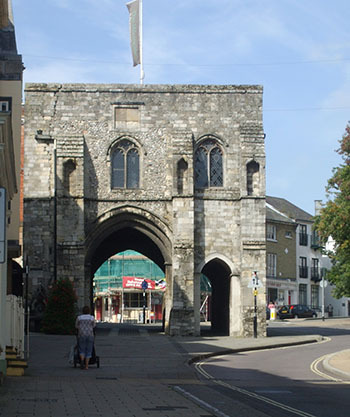 The Westgate Winchester is at the opposite end of the High Street from King Alfred's Statue. Like the Eastgate it was the entry and exit to the city. Not suitable for modern traffic, but before the 1960's traffic did go in both directions through that arch!!! Vehicles were smaller then! The gate is Norman of course and built around the 1100's with modifications in the following two centuries. It was during this modifications that the portcullis was put in as well as the two gun ports. Times were troubled in the era of the Plantagenet Kings. Housed in the Westgate, there has been a museum there for some time. Before that it was a prison during the period 1500's to 1700's. Look at the walls of the upper chamber there are names carved in the stone from this period. The city needed somewhere to store its archives in 1898 and the Westgate was obtained for the purpose and to house a museum. A particular treasure is the painted ceiling from Winchester College, once again an association with the marriage of Queen Mary I and Philip of Spain. Go on up to the roof, the view of Winchester is stupendous. Do not forget the camera!!!! Access to the museum is through a door at the side and up some old stone steps so not wheelchair friendly. An impressive building, but the Great Hall is all that still exists of Winchester Castle. When it was built it was cutting edge technology with its fine light architecture. Now houses an interesting museum including the replica of Arthur's Round Table hung on the wall. Close by are excavations of the castle's foundations put there a thousand years ago!! The Royal Hampshire Regimental Museum © Copyright Chris Talbot and licensed for reuse under this Creative Commons Licence. Near the castle is the area known as Peninsula Barracks. Here there are five military museums all close together on a site that has been occupied since Roman times. Alfred the Great lived on the site and it was also part of the castle itself. Can make a very informative day all on their own! Recommended as something different. 5. Museum of the Adjutant-General's Corps. 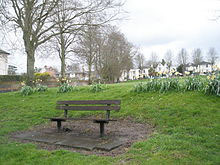 Today it is a delightful spot, an attractive place for a quiet picnic or game with the youngsters. 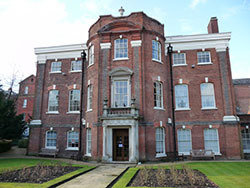 One of the venues for the Hat Fair at the beginning of July. Distant vistas of St Giles Hill. The area started life as the beginning of Winchester! In the iron age it was a hill fort. Now a conservation area it is bounded by Clifton Road and Clifton Hill as well as St Paul's Hill. 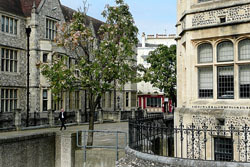 These are later buildings on the site of the original castle. For opening times and other information please click the above link. Not wheelchair friendly as the museum is approached via a stairway. Would be wise to check as sometimes they are closed for civic functions. It is still a functioning part of Hampshire County Council. For opening times and a great deal more information click the above link.